The Beauty... The Beast... The Beat! It was the first English-speaking animated feature film ever made entirely in Canada, and noted for its bright colors, pop soundtrack, suggestively-drawn female characters, story of good vs. evil, and dazzling effects. 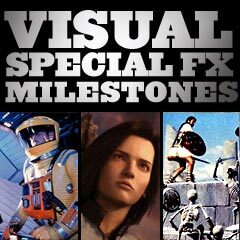 The animation used a variety of special effects, from models to paintings to very basic but impressive CGI. It marked the first animated film to use computer graphics, although it was only used in a limited way for just a few of the film's images. Unfortunately, the film reached only limited theatrical audiences and was a major flop. Most of its viewings were on late-night Canadian television. The story was about a malevolent, retired, decadent and obsessed rocker named Mok (voice of Don Francks) who kidnapped Angel (voice of Susan Roman) - a young singer in a struggling band, for her "special voice." He needed her to summon a demon creature behind a doorway to another dimension - her voice could help him crack the ancient code. The original Return of the Jedi featured over 900 visual effects shots, the most in movie history up to that time. The main computer-generated animation sequence was in the main briefing room of the Headquarters Frigate, during the scene of a planned Rebel attack on the second Death Star space station. A holographic wire-framed model of the Death Star was suspended in mid-air, moving around the shape and eventually exploding. Lucasfilm's Computer Division created the single effect: a wire-frame "holographic" model of the Death Star under construction. George Lucas continued to alter his original trilogy with lots of 'enhancements' and changes, and most outraged fans with the 2004 DVD re-release by using CGI to erase Sebastian Shaw's ghost spirit image from Return of the Jedi in the final celebration scene (on the left) and replace him with Hayden Christensen (who played Anakin Skywalker/Darth Vader in the 2002 and 2005 prequels) -- Shaw passed away in 1994. Another creation was Jabba the Hutt, the Tatooine crime boss seen as an immense, slug-like creature. If CGI had been advanced enough, Jabba would have been computer-generated, but as it was, Jabba was a one-ton puppet that took three months and half a million dollars to construct. The sequence was created, one frame at a time, by video game company Atari, Inc. in cooperation with Warner Brothers. It took 3 1/2 months and cost $125,000 dollars to create. They had planned to base a video game on the sequence, but it never happened. This was the first CGI animation with motion blur effects (using the principles of 'squash and stretch' from traditional animation) to produce more fluid and realistic movement in characters. Director Steven Spielberg's darker, more violent, and relentlessly-active adventure film sequel paid homage to the classic saga Gunga Din (1939). It had two Academy Award nominations, and won for Best Visual Effects, defeating its two competitors: Ghostbusters (1984) and 2010: The Year We Make Contact (1984). It was, in many respects, responsible for the creation of the MPAA's PG-13 rating. This was due to the controversial sacrifice scene in the underground Temple of Doom. A Thuggee religious cult ceremony was held to appease the Hindu goddess Kali. The ritual was led by demonic high priest Mola Ram (Amrish Puri), who ripped the still beating heart out of a human sacrifice victim (Nizwar Karanj) and held it up in his right hand. The screaming victim remained alive and was lowered in a large cage into a red-hot magma pit where he was incinerated, while the other worshippers worked themselves into a frenzy. When the victim's body burst into flames, the heart still in Mola Ram's hand also caught fire. This was a groundbreaking film - it was the first film to feature the extensive use of CGI -- most importantly, the integrated use of photo-realistic, computer-generated (CGI) models for all Gunstar vehicles or spaceships, for planet shots, and for high-tech hardware, rather than more traditional miniature models (as in 2001: A Space Odyssey (1968) or Star Wars (1977)). This was called digital scene simulation or 'integrated CGI' - the special effects were actually representing real-world objects, and the CG was fully integrated with the live-action. A multi-million dollar CRAY XMP-2 super-computer over a period of more than two years was used to create and animate the photorealistic computer graphic images - about 25 minutes worth of CG effects. Digital-graphic pioneers John Whitney, Jr., and Gary Demos, who contributed to the CG work in the film (and for Tron (1982)), received the Scientific and Technical Academy Award in 1984 “for the practical simulation of motion-picture photography by means of computer-generated images." This was the first anime film to use CGI - to supplement its traditional animation. It mixed high-tech computer-graphic animation with more traditional animation. In fact, 2D hand-drawn animation still makes up the majority of Japanese anime. Anime with 3D CGI character animation remains rare, although computers are often used for computer coloring (or digital paint). Director James Cameron's movie was the first of four science-fiction action-thriller films - it has often been considered by most film reviewers to be a better-crafted film than its popular sequels, with fewer special-effects and pretention. It was set in post-apocalyptic 2029 Los Angeles, when an indestructible, invincible, inhuman cyborg Terminator T-800 (Arnold Schwarzenegger) was sent back from the future year 2029 to 1984 to eliminate Sarah Connor (Linda Hamilton), who would one day be the mother of a son (an off-screen John Connor) who was to lead a human Resistance movement-rebellion against the evil cyborg leaders of Earth's future. 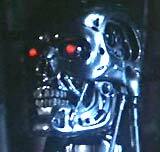 Stan Winston's special terminator and visual effects, created by Fantasy II Film Effects, vividly and effectively presented a film-noirish environment and realistic stop-motion animation as the Terminator was transformed into a mechanical, red-eyed exo-skeleton when his flesh and blood were stripped away in the course of his unstoppable pursuit. However, one of the most effective F/X sequences was the one in which the Terminator performed two surgeries upon himself (on his damaged right forearm and his left eye) in a bathroom - the result of crashing his stolen police vehicle. This science-fiction film combined computational fluid dynamics with CGI, for the first time, to create the planet Jupiter. The impressive end "Birth" sequence used CGI to create thousands of monoliths. Disney's PG-rated film (their 25th full-length animated film and the studio's first PG-rated animated feature film) was their first animated feature film to use computer graphics technology - in the simulation of a flying visible light source (digital fire). The film induced Disney animator Tim Burton to turn to live-action films, but he would later return with the use of innovative stop-motion animation for The Nightmare Before Christmas (1993). This Ron Howard-directed film won the Best Achievement in Visual Effects Academy Award, defeating Return to Oz (1985) and Young Sherlock Holmes (1985). It was remarkable for Industrial Light and Magic's (ILM) depiction of the friendly, energy-light emitting alien lifeforms and their alien spaceship. The climactic arrival of the dazzling spaceship came during a fog-shrouded electrical storm. It was there to pick up an ascending boatload of retirement home residents who were promised eternal life on the faraway planet. In the final image, the spaceship appeared to be approaching its destination, the glowing Antarean planet. The first computer-generated, classic rock music video - "Money For Nothing" by Dire Straits, featured crudely-animated, box-shaped CGI characters with stiff-limbs. This film was subtitled: A Three Dimensional Journey. This was the first Anaglyph single projector 3D film created for IMAX/IMAX Dome projection, in Tskuba Science City, Japan. Using computer graphics, the film traced the development of life from the formation of atomic nuclei in stars to the molecular structure of water and DNA, zooming the audience through the five-billion-year evolution of our solar system - in stereovision. Somehow, this Steven Spielberg-produced film (with effects by Pixar when it was still part of LucasFilm and Industrial Light and Magic), along with Return to Oz (1985), lost the Best Visual Effects Oscar to Cocoon (1985) (see above). This film was the first to composite computer-generated animation with a live-action background. The Pixar group at Lucasfilm used new motion blur technology and its 32-bit RGBA paint system to create the effect. The CGI character was known as "the stained-glass man" - a knight composed of shards of stained-glass that came to life. With his sword raised, he marched through a church at night, and engaged in swordplay (in a 30 second on-screen sequence that took 6 months to accomplish) to murder the Vicar. The film also featured a stop-motion animated scene in which young John Watson (Alan Cox) was assaulted by a variety of cakes in a cake shop that came to life in front of him. In another scene, a chicken came to life on a dinner plate and attacked its astonished diner.